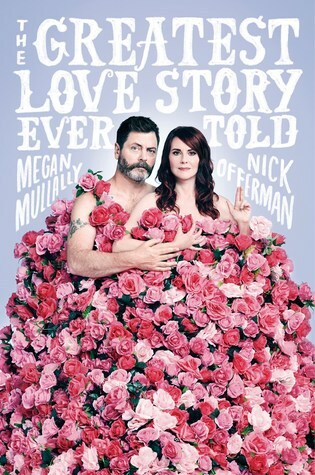 At last, the full story behind Megan Mullally and Nick Offerman’s epic romance, including stories, portraits, and the occasional puzzle, all telling the smoldering tale that has fascinated Hollywood for over a decade. I feel like this review is going to be short and sweet, because there is only so many ways that I can say that this book was brilliant and hilarious. I went into it expecting the book to be humorous, after all, Nick and Megan are both comedic actors. I don’t watch anything they’re in, so my only experiences with them has been on social media, and even though I did like them, I pretty much chose to listen to the book because I had heard good things about it and it fitted a challenge for OWLs Readathon 2019. I love listening to memoirs because you get a real feel for people and extra weight to their stories. This was no different, and actually felt more like listening to a podcast than a book. There were sections where just one of the authors was reading from the book, which was great and an individual section written by them, but it was when they were together that they shone (something I feel like probably reflects their relationship as a whole). Their chemistry was infectious and their comedic and supportive timing was something that really made it feel like you were listening to a conversation, to a story being told at a local bar rather than from the pages of a book. Many relationships, especially celebrity ones, either exude a feeling of forced brevity and happiness, or become intolerably touchy feely, yet somehow these have avoided that. Their love shines through not because they say it, but because you can hear it in the way they reverently speak about one another and when they talk about their careers and their partner’s careers. They have a great fondness for one another’s friends and family and clearly share so many similar values that you can feel how compatible they are instantly. Hearing about their different paths within the same industry was fascinating. Hollywood is an industry that encourages the worst aspects in humans and these two have found a solace in one another and remained true to themselves and their values. They support one another unconditionally, and even when they have opportunities they maintain a 2 week rule that puts their relationship above work. I find this quite inspirational. I am not someone who has this level of commitment in my life, but Hollywood and acting is uncertain, and we are told of relationships breaking apart because work got in the way regularly, so to understand how they bridge their physical and emotional gaps when they’re working away was really interesting. I also found the discussions about their relationship honest and enlightening. Their candid answers to questions clearly posed by editors and alike were equal part fascinating and heartwarming. Their age difference on the outside would seemingly have a large affect on them, but they are clearly kindred spirits and I like how their differing ages have no real effect on the way they work as a couple, if anything, it plays to their favour. They speak refreshingly honestly and normalise fertility struggles, and as its nice to hear that they would have had kids if it worked out ut actually they feel like their life has worked out because they didn’t have them. They’re dedicated pup-parents, and ultimately, doing puzzles and spending time together (often in technological time out) if their truly happy place. It hasn’t made me want to watch more of their stuff, I won’t lie to you, but it really brought me joy listening to this book (and the ‘secret’ audiobook only chapter!). They were funny, as in laugh out loud funny; they were loving in a genuine and not vomit-inducing way, and ultimately, listening to their story was nothing short of a pleasure! When all is said and done, that title might be onto something! I read this last year, It is such a cute, funny, and genuine read. I really liked how they formatted it. Yes! That’s exactly how I felt. It was so genuine and heartfelt and as they’re naturally so funny, it was wonderfully in sync! I *love* Nick Offerman, like too much. And I listen to every book of his, and every book he narrates, because he’s amazing. I have no listened to this yet even though I preordered it months before it came out! I try to listen to my audiobooks in purchase order so if I don’t like it, I can return it before the year runs out. I kinda think I might love him too. He is amazing and this book was pretty awesome. Yes girl! If it’s been less than a year since purchase and it wasn’t a free offer, you can return -any- audiobook on Audible. If it gets excessive/you abuse it, they will ban you for a period of like 3 months or something. But you can get your credit back or the money spent, even the coupons. So awesome when you’re like oh crap I hate this narrator! lol. Or you just hated the book. Or you accidentally purchased it when you already own the e-book. I have done this. lol. I’m not one overdo that kind of thing but I can’t listen to a book with a narrator that makes my ears cry so this changes EVERYTHING.